You'll be £5.20 closer to your next £10.00 credit when you purchase Tumult & Tears. What's this? During the First World War and its immediate aftermath, hundreds of women wrote thousands of poems on multiple themes and for many different purposes. Women’s poetry was published, sold (sometimes to raise funds for charities as diverse as ‘Beef Tea for Troops’ or ‘The Blue Cross Fund for Warhorses’), read, preserved, awarded prizes and often critically acclaimed. Tumult and Tears will demonstrate how women’s war poetry, like that of their male counterparts, was largely based upon their day-to-day lives and contemporary beliefs. Poems are placed within their wartime context. From war worker to parent; from serving daughter to grieving mother, sweetheart, wife; from writing whilst within earshot of the guns, whilst making the munitions of war, or whilst sitting in relative safety at home, these predominantly amateur, middle-class poets explore, with a few tantalising gaps, nearly every aspect of women’s wartime lives, from their newly public often uniformed roles to their sexuality. In "Tumult & Tears," social historian Vivien Newman estimates that, out of 2,000 British war poets whose work was published during World War I, nearly a quarter were women. She expands and enriches our understanding of that war, and its resulting poetic tradition, by surveying the words and experiences of those ignored by the usual canonical field pieces. The 224-page trade paperback presents a far-flung and accessible selection of poetry, organized by themes of women's changing roles in war, religion, uniformed service, nature, and grief. Where possible, Newman includes biographical sketches of each poet cited, providing personal context in addition to the social and political. Newman's scholarship often delivers cascades of insight and epiphany. Take, for example, the concept of woman as mourner: That wives, girlfriends, and mothers might grieve for lost soldiers is no surprise. Newman introduces examples of others, however, just as valid in their experiences of grief. Consider the unrequited lover, the mistress, the nurse, the nanny. These are complicated, complicating voices. Not all are polished, but each is worthy of note. Each is a potential revelation to readers. This book provides fascinating reading and an alternative view of women's wartime lives, including personal intimate details, whether they were civilians or serving in uniform. This collection is a further step on the way to fully acknowledging the full extent of women's involvement during the conflict and after. 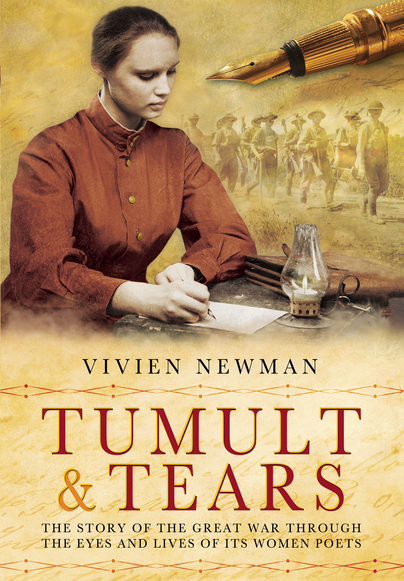 Tumult & Tears demonstrates that female poets drew their subjects from their day to day experiences and beliefs – just as their male counterparts did. The poems exhibit the roles which women adopted: mother, daughter, wife, sweetheart; nurse, volunteer, war worker. And the influences which bore upon them: labour, grief, love, fear, faith, community. As an introductory resource, this book is a success. During the war hundreds of women wrote thousands of poems on a variety of themes. Some of it was sold to raise funds for troops' charities; much of it was often critically acclaimed. Most of it is now largely forgotten or very rarely read, so this book, gathering together some of the best, is very welcome during the 100th anniversary period. The author has placed the poems chosen in their wartime context, from war worker to parent, grieving mother, sweetheart and wife. Some of the poems were written within sound of the gunfire at the front, while others were penned safely at home. It makes for a fascinating read and a collection well worth a look, removed as it is from the usual diet of male war poets. Taken in the round it is an excellent and thought provoking collection. From the dedication, abbreviations contained in the book and introduction about women’s war poetry, right through to the comprehensive index at the back, this book is a treasure trove of information both relating to the poems included and the background history of the conflict. A most enjoyable read and one I would strongly recommend to anyone who likes poetry.